While I was studying English in college (I later opted for a more practical course of study, and graduated with a degree in theater arts), one of the classes I took dealt with grammar. The professor’s pedagogical approach? Pass out mimeographed copies of his manuscript for a grammar textbook — do you care to carbon-date the year I took this class? — and spend most of each session plodding through a few pages, asking students to identify the part of speech of each word not in occasional exercises, because there weren’t any, but in the instructional text itself. It didn’t work for me, though. I passed the class, but with only a tenuous grasp of grammar, and years later, well along in my editorial career, I was still shaky on the difference between adjectives and adverbs. Does that really matter? Is a command of parts of speech essential for writers and editors? Yes, and no. 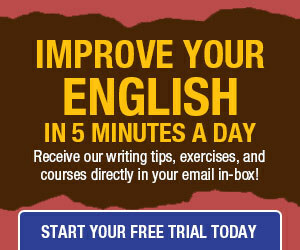 Some DailyWritingTips.com visitors praise me for writing posts about grammar. Others castigate me for boring them with the same entries. By the same token, my professor’s thespian approach to learning must have seemed ideal to some of my classmates, even as I sat there glumly disengaged, getting some parts of speech right but, as I recall, missing more than I hit. So, even though I have relied throughout my career on a more holistic approach to shaping or reshaping my prose and that of others, trusting my instincts to know whether something reads well or requires (or is at least improved by) revision, I have also acquired a great deal of technical knowledge about grammar, and have benefited from this store of lore. Another issue in the variety of responses to my posts about technical matters is that some site visitors are more experienced than others; a recent critic identified himself as a former instructor of college-level English. But for every retired academician, many readers are budding writers, would-be editors, and those for whom English is not their first language. With this disparity in mind, I try to not only cover a wide variety of topics (grammar, usage, style, technique, careers, etc.) but also discuss subjects with varying degrees of complexity. In other words, I try to please some of the people some of the time, which I think is the best I can do. And the tip for the day? Even though I do not remember my grammar class fondly, I do think it had a latent effect on my desire to understand the mechanics of language, which I had never considered before (except in isolation, when completing a worksheet in a precollegiate English class). So, even if you think of yourself as a holistic learner, rather than a technically inclined one, know your grammar vocabulary (like the difference between a dangling modifier and a misplaced modifier), and endeavor to visualize sentences as machines whose components can usually be arranged in more than way but are often discovered, in one’s writing or reading experiences, broken and awaiting repair (or doomed, on the printed page, to a perpetual state of disarray). Rely on your Zen approach to crafting or reshaping prose if it works for you, but know your tools as well. I wanted to add my comments. I’m not sure if I have before. I’m probably one of the more experienced among your readership. I read your posts and go, “yeah, that’s how you do it.” Then I go and beta read someone else’s work. After a few curses I send them to your blog. 😀 You present in a concise and clear manner. You make the rules simple and easy to digest. I haven’t been following long enough for repeats, but I look forward to them. Every now and then I’ll think, “what was that rule again?” and by gum, there it is in your post two weeks later (sometimes the next day). I love your blog. Just wanted to let you know. A sound knowledge of grammar is also a must for a professional translator. Not only do you need to know the grammar of the source language, in order to understand what the original text means, but you also need to grasp the mechanics of the language into which you translate. Without such knowledge, little grammatical errors can creep in and change the meaning (through as seemingly little as a misplaced comma) or give a bad impression; as a widely retweeted article published on the BBC website recently observed, poorly written websites can kill business sales, as potential customers head off to more professional-looking operations instead. So keep up the good work :). I’ve been getting your newsletter since I saw it referenced on http://www.asktheheadhunter.com since early 2009. At first, I just glanced at most, and studied some, but lately I’ve been reading most and glancing at some. All get filed, some printed, a recent post on blogging is taped to the back cover of my journal to remind me to get started when I finish Volume One. I guess I’m trying to say this newsletter and website are not just useful, but essential. I might flounder without them. Speaking of dating yourself, do you know the difference between a mimeograph and a stencil? I’ve done both! Take care, and please keep going. Both Kimberly and Oliver expressed reactions similar to my own. I urge my students to follow your writing tips. Hear, hear! What cook worth his salt will concoct a chef d’oeuvre without a thorough knowledge of his ingredients? Or how can an architect design a skyscraper without an understanding of the materials that will hold it together? Vive la grammaire! When I was homeschooling my daughter I gave a lot of thought to whether grammar needed to be taught at all. It seemed to me that kids with a knack for language would learn correct grammar merely by experiencing the language being used properly, whereas kids without the knack are unlikely to profit from a laborious dissection of sentence construction. But to talk about grammar, you need to know the names for things. A mechanic can fix your car without knowing the names of any of his tools or car parts, but if he tries to teach someone else how to fix a car, it becomes laborious saying, “Now take the small pinchy tool thing and use it to tweak the little doohickey on top of that big, round…” So I figure people who want to talk about language need to know the names of its parts. Maybe other people don’t. I, too, love your column, but am wondering whether your penultimate sentence was a test for your readers. Did you mean to say “…more than ONE way…” in reference to sentence construction? Test or not, it made me feel a little better about my own pattern: write, rewrite, reread, get out the fine-toothed comb, declare the final product ‘perfect’ before sending it off to my 82-year-old mother, who ALWAYS finds at least one mistake! English is not my native language. However, there are years since I began to study it at school. Even now I can not write perfectly grammatically correct. When I need to write in English and I am not sure of my work, I prefer to use an online translator which is a reliable friend. I enjoy your work, though I must admit I’ve got mixed emotions about technical grammar skills. 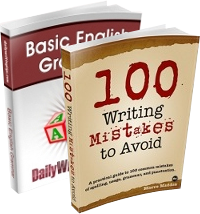 Even though I don’t know the names of grammar elements beyond the basics–adverb, gerund, etc.–I do know how to use them correctly (according to your columns). When I read your grammar rules I usually skip the instruction and go straight to the examples because they make more sense to me. I guess it’s a case of don’t tell me, show me. Do you mean ‘more than one way’? I understand the way you’ve written them still can be considered technically correct, but then I prepare technical reports for policy-makers who need as few distractions as possible to absorb the info presented. Foreign speakers might also benefit from the less cumbersome construction. Also, to elaborate on the points above by Cindy and Oliver, I always did fairly well at writing, but got to understand and appreciate the language so much more when back in college, I had to tutor small groups of foreign speakers. I love reading your posts with the great reminders and appreciate the experience you’ve brought to this blog. That’s an excellent analogy. Artists don’t need technical knowledge to practice their craft, but good ones do. That wasn’t a test. It’s what’s called a typo. Thanks for catching it. Not sure you really made a case here, as your title indicates. You’ve benefited from this store of lore… but how, exactly? I’ve always found that, while I can easily identify something as being “wrong” in a sentence, I usually cannot name the rule that it is breaking. In addition, having taught many students whose grasp of proper English was tenuous at best, I found that using grammar terms often became a barrier for them. Nothing makes the eyes of someone already struggling glaze over quite like “present perfect progressive”! I have intuited the rules through reading. Reading about it is a delight; it’s like cleaning my glasses – I get clarity where it formerly blurry. As you might note here, I have a lot of clarifying ahead of me. I appreciate that your posts are that they are bite sized and easy to digest. They are much appreciated. This is one of the most useful blogs out there, with a great mix of technical stuff and as well as “softer” subjects. I am pleased with it pretty much all the time. I finally understood the crippling effect of not knowing the language for grammar when I enrolled in freshman French. I’m sure I don’t have to explain what happened. Do I have to register to learn these documents ? I am slowly learning grammar after being out of school for more than 30 years. I recently returned to college, and found the need for proper grammar and writing skills. I am thankful for this blog. The variety is essential for me.